The title compound belongs to the class of bis-azomethine pigments. On thebasis of comparative studies on similar structures, insight into the complexexcited state dynamics of such compounds has been gained. It has been shown,for example, that only compounds that possess hydroxyl groups arefluorescent, and that the possibility for cis-trans isomerisationand/or bending motions of the central bis-azomethine fragment allows fordifferent non-radiative decay pathways. The compound, 4,4'-dihydroxy-1,1'-naphthaldazine (1) was synthesized andcharacterized by means of spectroscopic and quantum chemical methods. Thetautomerism of 1 was studied in details by steady state UV-Vis spectroscopyand time resolved flash photolysis. The composite shape of the absorptionbands was computationally resolved into individual subbands. Thus, the molarfraction of each component and the corresponding tautomeric constants wereestimated from the temperature dependent spectra in ethanol. According to the spectroscopic data the prevalent tautomer is the diol form,which is in agreement with the theoretical (HF and DFT) predictions. Theexperimental data show, however, that all three tautomers coexist insolution even at room temperature. Relevant theoretical results wereobtained after taking into account the solvent effect by the so-calledsupermolecule-PCM approach. 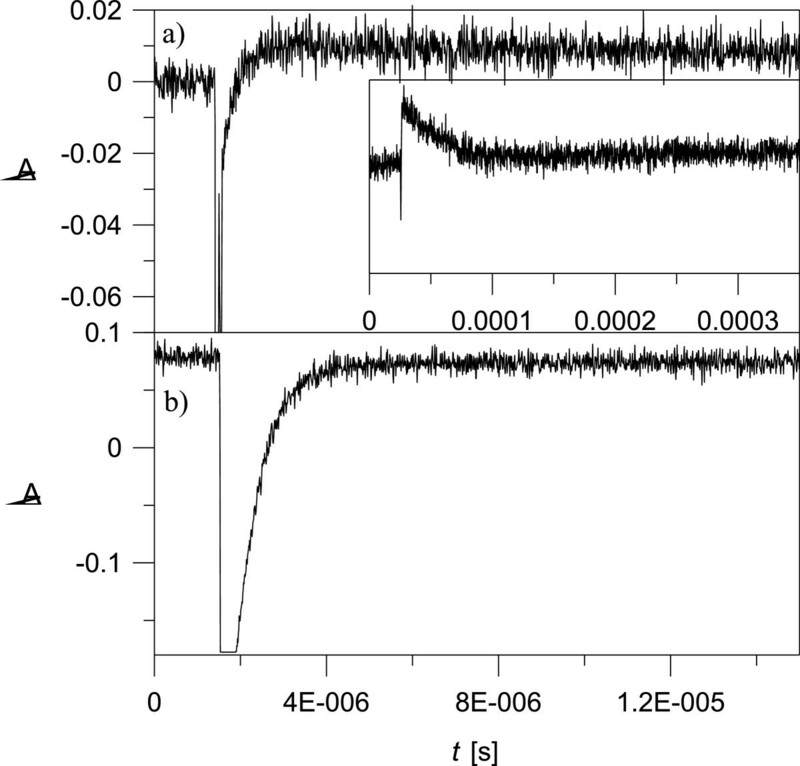 The TD-DFT B3LYP/6-31 G** calculatedexcitation energies confirm the assignment of the individual bands obtainedfrom the derivative spectroscopy. The studied compound,4,4′-dihydroxy-1,1′-naphthaldazine (1), belongs tothe class of bis-azomethine pigments. The most studied example is the Pigment Yellow101 (P.Y.101), depicted in Figure 1, which is the onlycommercially available fluorescent yellow pigment that shows strong fluorescence incrystalline state. The fascinating photochemical properties of P.Y. 101 have beensubject of intense studies combining crystallography, time resolved spectroscopy [1, 2] and high-level quantum chemical calculations [3–5]. 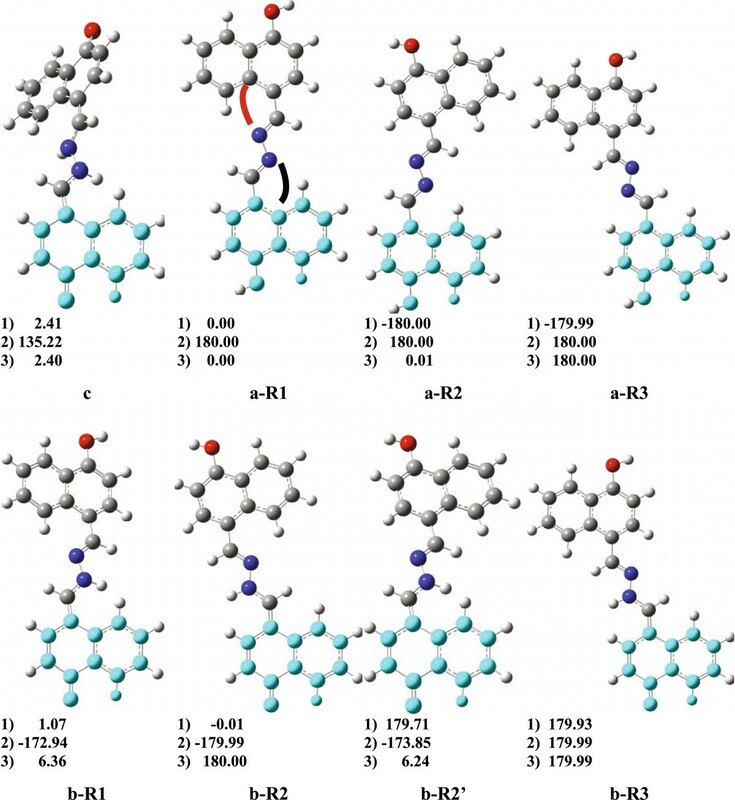 Based on comparative studies on similar structures, shown inFigure 1, it has been possible to gain insight intothe complex excited state dynamics of these compounds. It has been shown that onlythe compounds that possess hydroxyl groups are fluorescent. The presence ofintramolecular hydrogen bonding has been proved to be responsible for the ultrafastESIPT (excited-state intramolecular proton transfer) process and also for the highphotostability of P.Y.101. Additional intramolecular rearrangements, such ascis-trans isomerisation and/or bending motions of the centralbis-azomethine fragment, play also important role in the different non-radiativedecay pathways. 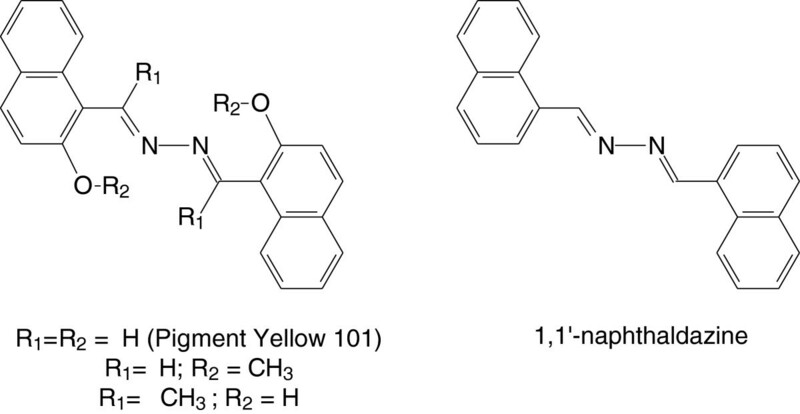 Molecular structure of Pigment Yellow 101 and other derivatives of1,1 ′ -naphthaldazine. Accordingly, we focused our study on a compound that possesses hydroxyl group but nointramolecular hydrogen bonding is present i.e.4,4′-dihydroxy-1,1′-naphthaldazine (1). Thestructure of the title compound is given in Figure 2together with the possible tautomeric forms. The spectral properties of compound 1were studied by means of steady state electron spectroscopy accounting for variousexternal factors, such as temperature, solvent polarity and acidity of the medium.Additionally, laser flash photolysis was used to get an idea about the protonexchange under laser excitation. The structure and the spectroscopic properties ofthe possible isomers of 1 were evaluated by means of quantum chemical calculationsin order to find plausible explanation of the experimentally observed spectroscopicdata. Schematic representation of possible tautomers of compound 1. All solvents and reagents used were AR grade. Fluka silica gel/TLC-cards 60778with fluorescent indicator 254 nm were used for TLC chromatography andRf-value determination. The melting point was determined incapillary tube on MEL-TEMP 1102D-230 VAC (Dubuque, IA, USA) apparatus withoutcorrections. The title compound, N,N’-bis-(4-hydroxy-naphthylmethylene)-hydrazine(1), was obtained from naphthaldehyde according to a standard procedure; i.e. toa solution of 1-hydroxy-4-naphthaldehyde (1 mmol) in EtOH (2 ml)hydrazine hydrate (0.5 mmol) was added and the mixture was stirred at roomtemperature for 4 h. No acid catalyst was used in an attempt to avoid theprotonation of the product. The residue formed was filtered off, washed withEtOH and then with Et2O, and dried in air to give 60% yield of 1 as ayellow powder; m. p. 235-236 °C (236°C); Rf - 0.15 (EtOAc:hexane 2:1); 1H NMR 7.03 (d,2H, J 8.0, CH-2 Ar), 7.58 (ddd, 2H, J 1.1, 6.8, 8.2, CH-7 Ar),7.70 (ddd, 2H, J 1.5, 6.8, 8.4, CH-8 Ar), 7. 97 (d, 2H, J 8.2,CH-3 Ar), 8.30 (dd, 2H, J 1.1, 8.2, CH-6 Ar), 9.25 (s, 2H,CH=N), 9.30 (d, 2H, J 8.4, CH-9 Ar), 10.96 (bs,OH) ppm; 13C NMR 108.5 (CH-2 Ar), 120.9(Cquat-4), 123.1 (CH-6 Ar), 125.2 (Cquat-10), 125.6 (CH-9 Ar), 125.8 (CH-7 Ar), 128.3(CH-8 Ar), 132.7 (Cquat-5), 133.4 (CH-3 Ar), 157.2 (Cquat-1), 162.0 (CH=N) ppm; COSY cross peaks 7.03/7.97,7.58/7.70, 7.58/8.30, 7.70/9.30; HSQC cross peaks 7.03/108.5, 7.58/125.8,7.70/128.3, 7.97/133.4, 8.30/123.1, 9.25/162.0, 9.30/125.6. The IR spectrum was recorded on a Bruker IFS-113 FTIR Spectrometer in KBr. TheNMR spectra were recorded on a Bruker Avance DRX 250 (for 1D) and Bruker AvanceII+ 600 (for 2D) spectrometers in DMSO-d6. The chemical shifts werequoted in ppm in δ-values against tetramethylsilane (TMS) as an internalstandard and the coupling constants were calculated in Hz. The assignment of thesignals in 1D NMR spectra is based on the observed cross peaks in 2D homo- andheteronuclear correlations COSY and HSQC, respectively. The UV-Vis spectralmeasurements were performed on a JASCO V-570 UV-Vis-NIR spectrophotometer,equipped with a Julabo ED5 thermostat (precision 1°C), in spectral gradesolvents. The obtained spectral curves were processed by a software foroverlapping bands decomposition [7, 8] and for derivative spectroscopy, developed by us . Laser flash photolysis experiments were performed using a setup thathas been described previously . Solutions were placed in quartz cells (4.5 cm long and1 cm wide) and excited by one of the following excitation sources: aLambda-Physik EMG 101 excimer laser operating at 308 nm (XeCl) with apulse energies of ca. 100 mJ and pulse widths of ca.30 ns. The photochemical stability of the samples was monitored. The quantum chemical calculations were performed with full geometry optimizationwithout any symmetry restrictions using the Gaussian 03 and Gaussian 09 programpackages . In order to evaluate the ground state properties of the studiedcompound, its potential energy surface was searched for stable conformers.Geometries of nineteen possible rotamers and tautomers were optimized by thesemiempirical AM1, ab initio Hartree-Fock and DFT methods. Vibrationalfrequencies were computed in order to verify that local energy minima wereattained. Selected structures were additionally optimized using the densityfunctional theory (DFT) and two hybrid B3LYP and M06-2X functionals [12–14] with two different basis sets, 6-31G** and def2TZVP . Vertical excitation energies were calculated employing ZINDO andtime-dependent DFT (TD-DFT) with the B3LYP/6-31G** at the equilibrium geometriesof the most stable conformers. The solvent effect was taken into considerationby the polarizable continuum model [16, 17] and IEF-PCM/B3LYP geometry optimization at the 6-31G** level inmethanol were carried out using the standard united-atom cavity model, asimplemented in G03 software. Solvent-solute interactions were modeled adding onemethanol molecule close to the enol OH group of compound 1 so thatintermolecular hydrogen bond, of type (solv)O….H-O, is formed. The modelswere optimized by B3LYP/6-31G** method, and the supermolecule-PCM approach wasemployed, doing IEF-PCM/B3LYP geometry optimization at the 6-31G** level inmethanol of the optimized solute-solvent complexes, similarly to someazonaphthols [18, 19]. The optical properties of compound 1 were studied by means of steady stateabsorption and emission spectroscopy and laser flash photolysis. Fluorescencemeasurements of ethanol solution of 1 showed that it is not fluorescent.Comparing with the fluorescent properties of the hydroxyl-group containingP.Y.101 and its derivatives, it can be concluded that the presence ofintramolecular hydrogen bonding is operative for their strong fluorescence,while the competitive isomerisation via bond rotation might serve as anon-radiative decay pathway. This is in line with the observation of very strongfluorescence of P.Y.101 in solid state . 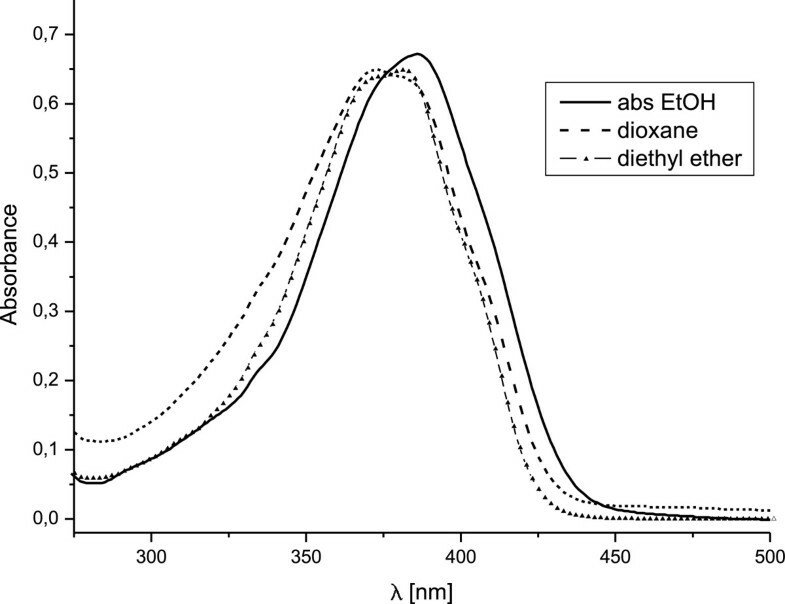 Absorption spectra of compound 1 were recorded in various solvents and thenormalized spectra in absolute ethanol, diethyl ether and dioxane are presentedin Figure 3. Bathochromic shift is observed goingfrom diethyl ether to ethanol and DMSO showing maxima in the spectra at 381, 386and 393 nm, respectively. Although that there is no significant differencein the shape of the absorption band (complex contour containing number ofindividual subbands, see Figure 3), we willemphasize on the change in relative intensities of the subbands, composing theoverall contour, in three of the solvents. The observed shift in the position ofthe absorption maximum in these solvents is most probably caused byredistribution of the intensities of the individual subbands. In addition, theintensity of the shoulder at ca. 330 nm decreases when going fromdiethyl ether to ethanol. Complete list of the apparent maxima in ten differentsolvents and the estimated position of the subbands, obtained from derivativespectroscopy, is presented in Additional file 1: TableS1. Taking into account the possible tautomerism in this compound, the observedspectral changes can be attributed to solvent caused shift in the position ofthe tautomeric equilibrium . Normalized spectra of compound 1 in absolute ethanol, diethyl etherand dioxane. For further confirmation of the presence of tautomeric equilibrium in solution,temperature dependent absorption spectra were recorded in three differentsolvents - ethanol, DMSO and chloroform. The spectra in ethanol, recorded in thetemperature range 20 – 60°C, are presented in Figure 4. Virtually the same temperature-dependent spectra wereobtained in DMSO and chloroform. In all three solvents the spectral changes upontemperature elevation are characterized by a slight increase at ca.330 nm and a decrease of the maximum at ca. 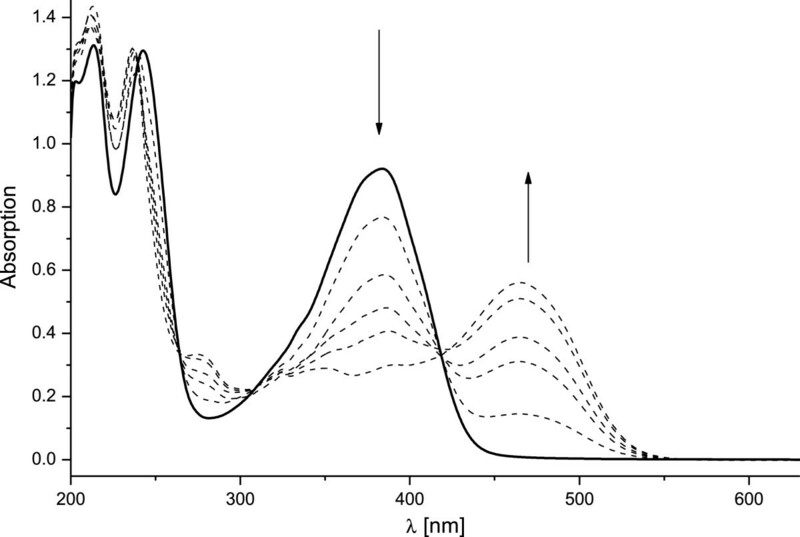 390 nm (see thedifference spectra in the inset of Figure 4).Although the observed changes in the spectral shape and the related isosbesticpoints are not very well pronounced, they give the first indication that atleast two species coexist in solution. 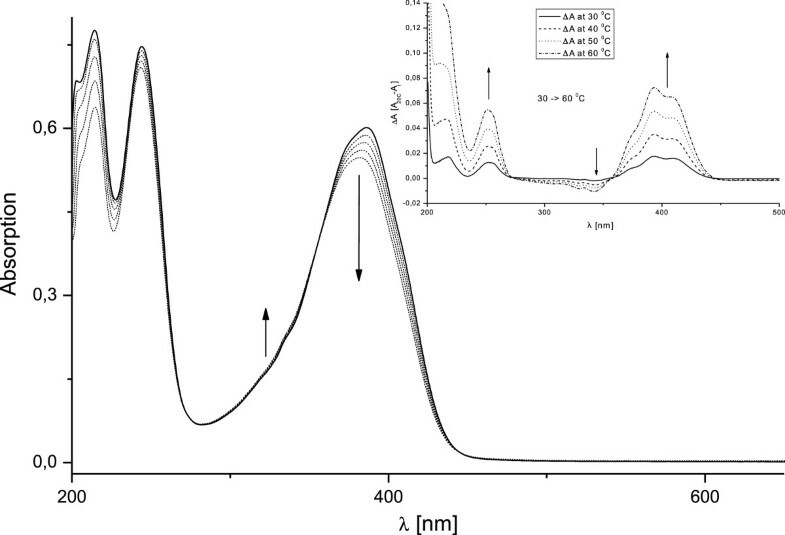 Initially, the species absorbing at 386and 330 nm were referred to as A and B, respectively, and thecorresponding equilibrium constant, KT=[B]/[A], was estimated fromthe temperature dependent spectra in ethanol. Accordingly, the calculated valuesfor ΔG are in the range of 2.26 to 1.53 kcal/mol (without accountingfor the solvent contraction) and the corresponding values for ΔH andΔS are estimated to 9.48 kcal/mol and - 24.01 cal/mol.K,respectively (Additional file 2: Table S2).Considering the complexity of the shape of the absorption band, we sought foradditional experimental evidences for coexistence of tautomers in solution, aswell as defining their types. Therefore, decomposition procedure and derivativespectroscopy were employed for the absorption spectra, and flashphotolysisexperiments were performed. Temperature dependence of the absorption spectra of 1 in absoluteethanol(1.7 × 10 -5 M),recorded in the temperature range 20 – 60 °C. Solidline - 20°C, dashed lines correspond to 30, 40, 50 and60°C. In the inset the difference spectra are shown. The different electronic structure of the tautomers, containing enol and ketofragment, determines quite different photochemical behavior. According toprevious flash photolysis study of azonaphthol tautomeric compound1-phenylazo-4-naphthol  upon absorption of a photon the E-form undergoestrans-cis isomerization (Scheme 1), whereas the keto tautomer does not show any detectabletransient signal. In addition, the cis enol tautomer does not obey thedirect cis-trans relaxation, being initially converted to theK-form and then to the corresponding enol form in order to restore the initialequilibrium tautomeric ratio. The process of relaxation of E cis to K is governed by a rate constant k1 and the restoration ofthe tautomeric equilibrium is defined by kII = k2 +k3. Possible tautomerization processes of compound 1 and the correspondingrate constants. The kinetic curves for solution of compound 1 in methanol, measured at 340 and at400 nm, presented in Figure 5, show a typicalketo and enol behavior, respectively. As can be seen from Figure 5 a, at 340 nm, there is a fast process(kI=3.18 ± 0.22 × 106s-1) of accumulation of the keto tautomer, followed by a relativelyslow process (kII=3.61 ± 0.13 × 104s-1) of returning to the equilibrium state (Figure 5 a inset). The changes at 400 nm can be attributed tothe initial decrease of the trans enol form, converted by the laserflash to cis form, followed by a rise - restoration of the equilibriumstate through the keto form. The process is complicated and consists of fast andslow components with rate constants similar to those measured at 340 nm.This behavior can be attributed to the complexity of the tautomers in 1, whereexcept the pure keto (c) and enol (a) tautomers, a mixed keto-enol form exists(b). Time dependence of the transient absorption of 1 in methanol solutionat 340 nm (a) and 400 nm (b). Based on the results from flash photolysis experiments it can be concluded thatthe species absorbing at 330 nm is the diketo tautomer (inFigure 2c) of compound 1 and coexists with themost stable diol tautomer (in Figure 2a). It mightbe expected, however, that the monoketo tautomer (in Figure 2b), being intermediate between (a) and (c), also exists in thesolution and this was actually suggested from the flash photolysis kineticcurves. In search of further confirmation to this supposition we performed adetailed assessment of the composite shape of the absorption spectrum observedin ethanol. A mathematical curve decomposition procedure for quantitativeanalyses of tautomeric equilibria, developed by some of us,  was applied for the temperature dependent spectra of compound 1 inethanol. As can be seen from Table 1, the diol form (a) is themain component at 20°C. The quantity of the diketo form (c) exceeds themonoketo tautomer (b). With the temperature increase the quantity of diol formdiminish, whereas those of the other two species rise gradually. At 60°Cthe quantity of the diketo form prevails that of the diol form, while thepresence of the monoketo tautomer is ca. 10%. The current observationis in accordance with the temperature dependent tautomerism in 4-phenylazo-1-naphthol, which shows lowering the quantity of the enol form by increasing thetemperature in ethanol, whereas the opposite trend is observed in the2-phenylazo-1-naphthol, 1-phenylazo-2-naphthol and the corresponding Schiffbases. In the case of compound 1 the enol – keto tautomerism takes placein two steps a ↔ b ↔ c, which are referred to as process 1 and 2,respectively (in Table 1). From the calculateddifferences in the Gibbs free energies for these processes the enthalpy and theentropy were calculated, too. The obtained results are as follows: for process1) ΔH1 = 5.66 ± 0.46 kcal/mol, ΔS1 =-13.76 ± 1.46 cal/mol.K; for process 2) ΔH2 = -4.17± 0.38 kcal/mol, ΔS2 = 9.11 ±1.22 cal/mol.K. Additionally to the observed spectral changes upon increasing the temperature,another phenomenon was observed in chloroform solutions. Due to the poorersolubility in chloroform the solutions were sonicated for certain time. As aresult, spectral changes were detected corresponding to protonation of compound1. The observed protonation is produced by the hydrochloric acid that is formedduring the chloroform sonication through radical intermediates. The mechanism ofthe sonodegradation of trihalomethanes is well studied  and applications of the protonation of some compounds as sonochemicaldosimeters are suggested . In Figure 6 the spectra of compound 1 inchloroform are presented. The inset shows the temperature dependent spectra of asolution that was sonicated for 3 seconds. The observed temperaturedependence is analogous to the one already described. However, additionalsonication for 3 minutes at 50°C leads to the spectrum presented inFigure 6 with solid line. It can be clearly seenthat a new intense band appears at 469 nm as a result from protonation ofcompound 1. Furthermore, the spectral changes upon decreasing the temperaturedown to 10°C were monitored in order to estimate the thermodynamicparameters of the observed equilibrium. 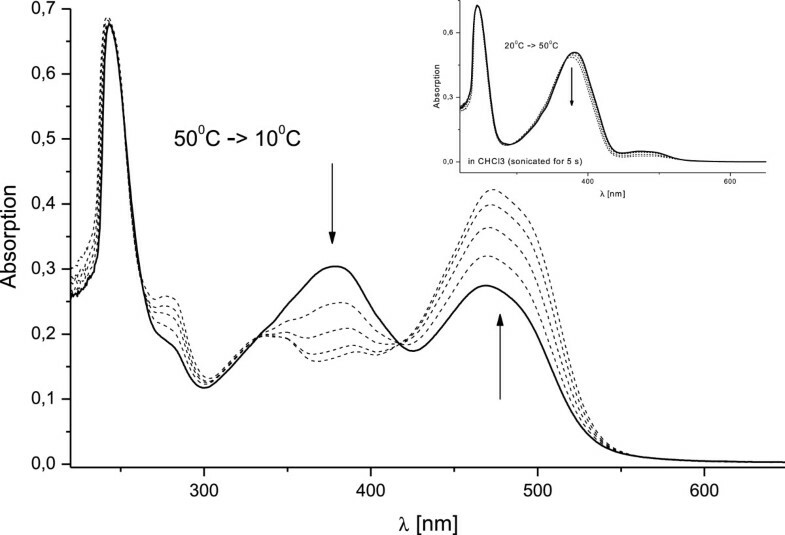 Effect of temperature and sonication on the absorption spectra ofchloroform solution of compound 1(1.7 × 10 -5 M)– temperature range 50 – 10°C , sonicationtime - 3 minutes; solid line - 50°C , the dashedlines correspond to 40, 30, 20 and 10°C. The inset showsthe temperature dependence (20 – 50°C) of a solutioninitially sonicated for 3 seconds. In order to confirm these results, a series of spectra were recorded in methanolwith increasing amount of added hydrochloric acid and are presented inFigure 7. The observed changes in the spectralshape are the same as the ones resulting from the sonication. Absorption spectra of 1 in methanol(2.7 × 10 -5 M)with addition of HCl. The solid line shows the spectrum withoutacid, dashed lines correspond to the spectra with increasingconcentration of the acid added:8 × 10-6 M;1.6 × 10-5 M;2.4 × 10-5 M;3.6 × 10-5 M;6.4 × 10-5 M.
The nineteen optimized conformers of 1 stem from the three possible tautomericforms shown in Figure 2; the diol form (a) the ketoform (b) and the diketo form (c). Moreover, the rotation around the N-N bond,leading to cis and trans isomers, was also taken into account.The trans isomers were found to be the preferred ones for all threetautomers. Furthermore, the rotation about the C-C bonds bearing the naphthylrings leads to formation of different endo and exo isomers.All tautomers shown in Figure 2, are inendo-endo form (both N-atoms’ electronic lone pairsare directed towards the neighboring naphthalene rings). The DFT(B3LYP/6-31 G**) calculated energies of the most stable conformers of thetautomers a – c are listed in Table 2 and theoptimized structures of the possible conformers of the tautomers (a), (b) and(c) are depicted in Figure 8. It must be noted thatthe most stable isomer of compound 1 is the endo-endo rotamerof the diol tautomer, a-R1 in Figure 8, whereas thecrystal structure of P.Y.101 shows that it exist in theexo-exo form of the diol tautomer (similarly to the a-R3in Figure 8). Apparently, the specificintramolecular interactions are operative for stabilization of the correspondingrotamers; the presence of intramolecular H-bond (N….H-O) in P.Y.101stabilizes the exo-exo form, while in compound 1 theendo-endo rotamer is stabilized by the N….H-Cinteraction. The N….H-C distance in the optimized structure of a-R1 is2.213 Å, its geometry is completely planar and it is the isomer withthe lowest energy. Rotation about each C-C bond in the structure of the dioltautomers leads to the other two conformers of the diol tautomer - the a-R2 anda-R3 structures, which are also planar as could be seen from Figure 8. On the other hand, upon tautomerization theendo-endo rotamer is no longer the most stable one of themonoketo tautomer (b) but the endo-exo form b-R2 (seeFigure 8 and Table 2). These data show that tautomerism of compound 1 is accompanied withrotation about the C-C bonds. As could be expected from streric point of view,the b-R2 form has also planar structure whereas the other two rotamers of themonoketo tautomer are slightly twisted (b-R1 and b-R2’). On the contrary,the optimized structures of the diketo tautomer (c) show almost perpendicularorientation of the naphthyl rings and it is hard to distinguish the differentrotamers. Therefore, only the energy of the most stable form is given inTable 2 and in Figure 8. Optimized structures (B3LYP/6-31 G**) of the possible tautomersof compound 1 , diol (a), keto (b) with some of their isomers, andthe diketo tautomer (c). The dihedral angles 1) and 3) aredefined between the N- and quaternary C-atom, as shown in a-R1, angle 2)is the C-N-N-C, and their values are given. The lower, light-blue partof each molecule is oriented in the same way in all structures forbetter visualisation of the conformational differences between thecalculated isomers. The optimized structures explain well the obtained dipole moments(Table 2) and the calculated vertical excitationenergies (Table 3). While in tautomers (a) and (b),the relative planarity permits the conjugation between the electron donor andacceptor parts of the molecule, the structure of tautomer (c) clearly shows thatsuch conjugation is not possible. Correspondingly, the TD-DFT calculatedexcitation energy for (c) is ca. 346 nm, while those fortautomers (a) and (b) are 367 and 393 nm, respectively. We shall emphasizethat this results agree well with the assignment of the experimentally observedspectra based on the decomposition procedure and the derivative spectroscopy(vide supra). Unlike the calculated spectral properties, thetheoretically predicted energies and relative stabilities in gas phase agreeonly qualitatively with the experimental observations. Therefore, we performedadditional calculations using a fitted hybrid meta-GGA functional with 54% HFexchange - M06-2X, specially developed to describe main-group thermochemistryand non-covalent interactions, in combination with a large basis set, def2TZVP.The latter basis set was used also in calculation with the B3LYP functional andHartree-Fock method. The ab initio HF calculations were perfomed forthe sake of comparison, since it has been shown that the DFT methods do notpredict correctly the relative energies of substituted azonaphthols . All data from our calculations are summarized in tables given inAdditional file 4. The main conclusions from theisolated-molecule gas-phase calculations are that both hybrid functionals withboth basis sets give virtually the same geometrical and energetical picture,predicting too large energy differences between the different tautomers ofcompound 1 (up to 20 kcal/mol). Such a disagreement with the experimentcould point out that the role of the media is not negligible and the specificinteractions between the solute and the solvent molecules most possiblycontribute by a large extent to the stabilization of the various tautomericforms. Oscillator strength is given in parentheses. *sites for protonation of species a+ and a+O are the N- and theO-atoms, respectively. In order to account for the interaction between the solvent molecules and thesolute, different types of adducts of compound 1 with a methanol molecule weremodeled and optimized. Amongst them the most stable ones, for the correspondingtautomeric form, were those in which the methanol molecule is attached byintermolecular H-bonding to the OH-group of the compound 1. The energydifference between the diol (a) and the monoketo (b) forms, with attachedmethanol molecule, is 6.09 kcal/mol as obtained from theB3LYP/6-31 G** calculations. Furthermore, we reoptimized thesesolute-solvent complexes in methanol media using IEF-PCM calculation. The resultfrom this supermolecule-PCM calculation lead to decrease of the energydifference between the diol (a) and the monoketo (b) forms down to2.46 kcal/mol. The obtained relative energies from the PCM calculation ofindividual molecules and the supermolecule-PCM, including a methanol molecule,are compared in Table 4. As can be seen from Table 4, formation ofintermolecular complex of (a) and (b) tautomers of compound 1 with a methanolmolecule do not cause appreciable change in the corresponding energy difference.It is the polarizable continuum model that leads to a lower energy differencebetween the tautomers. Taking into account the calculated dipole moments ofthese tautomers it is reasonable that the more polar (b) tautomer is betterstabilized in the polar methanol media. However, such effect cannot be expectedfor the relatively non-polar diketo tautomer (c). Indeed, the energy differencebetween (a) and (c) forms is lowered from 21.78 to 14.03 kcal/mol only, byinclusion the IEF-PCM in the DFT calculations. Nevertheless, this result doesnot agree quantitatively with the experimental data. The tautomerism in4,4′-dihydroxy-1,1′-naphthaldazine (1) was studiedby time resolved and steady state absorption spectroscopy. Temperature dependentspectra and laser flash photolysis indicate that the three possible tautomers arepresent in solution. The absorption spectra were decomposed into individual subbandsin order to estimate the relative abundance of all species present in the solution,applying two- and three-component analysis. Reasonably, the quantitative dataobtained by the two- and by three-component approach are in close agreement. It is frustrating to conclude that the calculated energy differences of the studiedtautomeric species agree only qualitatively with the experimental data. Inclusion ofthe solvent effect as polarizable continuum medium improves the resultssignificantly, but not enough considering the stability of the diketo tautomer (c).On the other hand, the optimized geometries and the vertical excitation energies arein accordance with the experiment. The complicated mechanism of the studiedtautomerism is possibly the reason for the poor agreement between the theoreticalmodels and the experimental data. As mentioned above, the tautomerism is accompaniedwith rotation about the C-C bonds. That is why the solvent molecules play crucialrole in the mechanism and the dynamics of the studied tautomeric processes. The financial supports from Bulgarian National Science Fund (Projects TK-X-1716and UNA-17/2005) are gratefully acknowledged. We thank Dr P. Mueller (Universityof Basel) for the flash photolysis measurements. Publication of the paper isfinanced by the Bulgarian Ministry of Education, Youth and Science in the frameof contract № BG051PO001-3.3-05/0001 “Science and Business”,within the Operational Programme “Human Resources Development”. AA performed all calculations and the steady-state spectroscopic measurements. SS andVK performed the synthesis, purification and structural verification of thecompound. LA generated the main idea of the research and performed the spectraldecomposition analysis and discussion of the flash-photolysis data. AA and LA wroteand finalized the manuscript. All co-authors edited and agreed with the present formof the manuscript. All authors read and approved the final manuscript.